"Recently, I got a second-hand iPad device for half the market price. It looked like a great deal at such price point until I realized that it is stuck at the Apple login page. The previous owner's Apple account pops up and it asks to enter a password to continue. Please help guys how can I get rid of this problem and how to remove Apple ID from iPad? Please help"
Apple devices are like the most secured mobile devices in the world. It is difficult for an unauthorized user to gain access to the device without entering the correct set of strings on the password field. Are you also stuck at such a situation like above? Well, this is a very common problem because most of the people prefer to buy such high-end devices in second-hand condition because of the budget. If you facing this problem then don't be anxious! In this post, you will find the best solution to remove Apple ID from iPad with and without a password. So, how do you remove an Apple ID from an iPad? Well, the best solution is to use Tenorshare 4uKey. Tenorshare 4uKey is capable of removing Apple ID password from any device running on iOS. Since this tool is very easy to use, you don't have to worry about time. The process of removing the password using the Tenorshare 4uKey is simple, fast, and straightforward. With 4uKey, you can recover password from different scenarios including forgotten iPhone passcode, entering wrong password for many times, iPhone screen broken, forgot iPhone restrictions passcode, and much more. Note: If your device cannot be detected by the software, you need to put the device into Recovery Mode. Step 2 Click on the "Start" to remove apple id. 4uKey will start to remove Apple ID immediately, the whole process will take just a few seconds and no data will be lost. When the whole process finished, you will see the following interface. You need to reset all settings of your device. Follow the interface to reset. After you reset all settings, your device will restart automatically, then 4uKey will start to remove the Apple ID. When the whole process completed, the following interface will appear. A data loss will happen for iOS 10.2 and below after the removing process. 2. For inactivated devices or the iOS 11.4 and above that has turned on Find My iPhone, this function is unsupported. This is a video link about how to remove Apple ID from iPad with/without password. Removing the Apple ID from the iPad if you remember the password is one of the easiest ways. Basically, if you have the password, you just have to enter the correct Apple ID and password in order to remove the Apple ID from your iPad device. Don't know how to remove Apple ID from iPad with password? Well, follow the below step by step guide. Step 1: open the "Settings", click on your name, go to the "iTunes & App Store". Step 2: tap on the "Apple ID", several options pops up, tap "View Apple ID",enter the password of the selected Apple ID. Step 3: Now, scroll to the iTunes in the cloud section and choose "Remove this device" button to remove the Apple ID from your iPad device. So, by following the above steps, you can easily remove old Apple ID from iPad device. If you are still facing any problem while executing the above steps then, follow the next part. Step 1 Install and run Tenorshare 4MeKey on your PC, Connect your target iPhone to it. Step 2 Tap Start Scan to get all the information in iPhone. Step 3 Now tap Apple ID and preview. Finally, tap Export. You can export the Apple ID and passwords to your computer. Have any query in the mind regarding how do I remove Apple ID from iPad? After analyzing the above post, we found removing the Apple ID password is easier using tools like Tenorshare 4uKey. This tool will bypass any password and reset your iOS system completely. 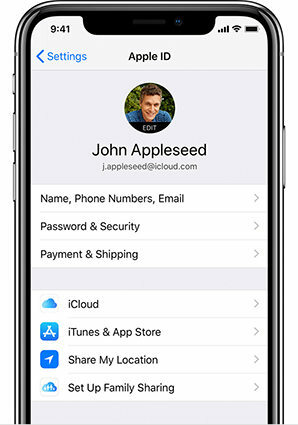 On the other hand, if you want to see or recover your Apple ID then Tenorshare 4MeKey is the best way by which you can find the password of Apple ID if you forgot the password by any chance. The process of password recovery and reset is very easy with the help of these software. Highly recommend tools!